Every year, my dear friend and show producer Dave Logan reminded us of this fateful day that changed the course of history in America and the world. I reprint it here for you, but to really appreciate all the work Dave put into it, you’ll have to read it here. Never forget. PEARL HARBOR TRIBUTE: Remember that it’s our responsibility to keep the memory alive and to pass this history on to the younger generations. Never Forget. 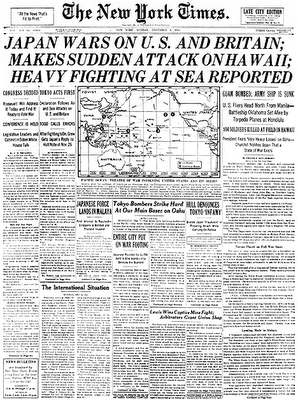 Below you will find videos, photos and many Pearl Harbor links related to that horrible morning 70 years ago. Take your time browsing through this post and feel free to pass it on to others. Before you continue, though, take a moment to think about how your day is going. Then think of how their day must have been. Never forget them, honor them always, thank them, pay tribute to them. Andrea…Orlando international Airport to ditch TSA? Andrea, Recently, on December 5th, Tom and I personally stood at the site of the USS Arizona in Hawaii. We also had the privilege to speak with a survivor of that fateful day, who shared his story with all the visitors at the Memorial. All I can say is, what a sobering moment in the realization of what happened that day as our tour guide gave the details of the events that unfolded on December 7, 1941. The personal accounts (both American and Japanese) leave you speechless and tearful for anyone that was caught up in the chaos and the war that followed. As one Japanese pilot that was part of the bombing group that day, reflected on his own personal feelings of that day in these words, “war is ugly and cruel”. This book lays out the diabolical plot by Pres. Roosevelt to get the United States into the war by allowing the attack on Pearl Harbor. He is the War criminal as much as Mussolini and Hitler. The horror……the horror that was met that day by our under manned Navy lying in harms way. Become informed…it was truly a day that lives in infamy but not as we have known. And this book has been in print for 58 years.